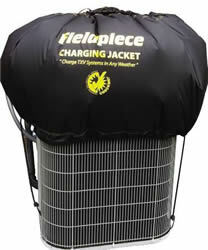 Fieldpiece Charging Jacket: A great solution for charging your AC in cold weather. Contractors - if you install air conditioners and heat pumps in the winter, you no longer need to wait until spring to find out if the system is charged correctly. Proctor Engineering Group has developed the Air Conditioner Charging Jacket. This easy to use device permits accurate refrigerant testing of TXV systems under cold weather conditions. It works by letting you precisely restrict the air exiting the condenser so you can control the pressure drop across the TXV.